This piece of GreenBell and ProfKeane fan art is dedicated to wyattloughrie, anne-de-breuil, chateaugrief, dolly—spiral, and Regulas314 who celebrated their birthdays last week, Dragonprince18, lashesgem, and ScarletRed101 who celebrated their birthdays two days ago, and Aleksandra aka Skyrawathi and Miamelly who celebrated their birthdays yesterday. So, I hope you all had such fabulous, phenomenal, and grand birthday celebrations. I wish you a lot of love, prosperity, and joy in your lives as artists and as people. I would also love to dedicate this to all of the awesome GreenBell and ProfKeane shippers out there. Sit back, relax, and enjoy. 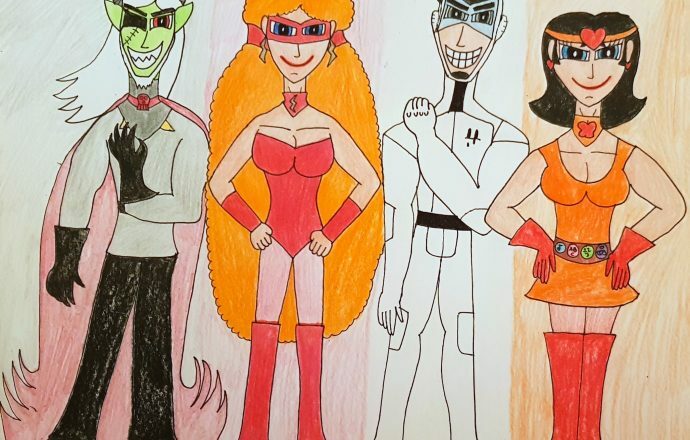 Before Team Xtreme ended up being Townsville’s greatest saviors, before their allies, The Phenomenal Four, aided them in keeping Townsville safe from evil while doubling that with wiping Citysville from crime, there was The Quantum Quartet consisting of Mr. Lucius Green who went by The Creature, Miss Sara Bellum who went by Mega Bellum, Professor John Utonium who went by PowerProf, and Miss Sandra Keane who went by Wonder Keane. They were academics heavily involved in science, education, politics, philosophy, and social sciences by day and superheroes during their breaks. 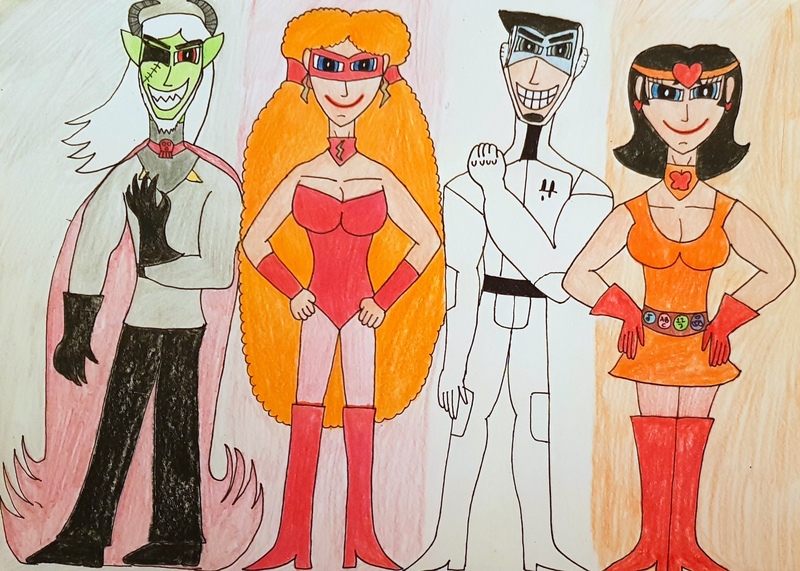 Yes, I know Professor Utonium’s PowerProf getup was created in order to spend more time with the Powerpuff Girls, thus fighting crime together, but where my headcanon is concerned, Mr. Green, Mrs. Bellum-Green, Professor Utonium, and Mrs. Keane-Utonium were, once upon a time in the 80’s, Townsville’s superheroes akin to the Fantastic Four before retiring the gig in the 90’s to live their normal lives in their chosen professions. Yes, this type of passing the torch is also akin to The Incredibles, what with Mr. Green and Mrs. Bellum-Green being the Rowdyruff Boys’ parents and Professor Utonium and Mrs. Keane-Utonium being the Powerpuff Girls’ parents, because it does show the dynamics that these two families have when it comes to occasionally helping their children and grandchildren save Townsville and the world. Moreover, in my headcanon involving The Quantum Quartet, Professor Utonium is the one who creates the costumes such as his PowerProf getup, Mr. Green’s Creature Cape, Mrs. Bellum-Green’s Mega Bellum mask, top, gauntlets, and jet boots, and Mrs. Keane-Utonium’s utility belt, headband, and jet boots and ensures that they are durable in every mission. He is essentially a combination of Iron Man’s Tony Stark and The Incredibles’ Edna Mode, thus making him the brains and the savvy technician of this quartet of older generation superheroes. Mr. Green aka The Creature is the gentle giant. He is compassionate, kind, and merciful towards his teammates and is a gentleman in every single way. However, if one were to be on his bad side, he would transform into a vicious demon complete with fangs and grotesque features and give that felon not only a well-deserved scare but also a willingness to run to the nearest policeman to turn himself in. Mr. Green or The Creature is quite akin to The Thing, in which he is a supernatural creature who bears a lot of humane qualities, in spite of his outwardly haunting appearance. Mrs. Bellum-Green aka Mega Bellum is the tactician who always ensures order and great teamwork within their group. She is an expert at hand-to-hand combat and she can effectively think fast on her feet. Her gauntlets are also used as shields to protect her from any attack. Mega Bellum is a combination of the Pink Sapphire and Wonder Woman considering that she is a magnificent combination of brains, brawn, and beauty. Mrs. Keane-Utonium aka Wonder Keane is the pacifist of this group who keeps the harmony going in The Quantum Quartet. Her utility belt is based on the subjects she teaches ranging from music to language and grammar to mathematics to values and principles. She would use these features in order to attack criminals and put them in their place, decode messages, decipher numerical codes, and receive emergency messages. Sure, her whole getup and skills are a combination of Wonder Woman and Batman, but Wonder Keane is akin to Mary Marvel in which she can combine strength, wisdom, and feminine charm to make her a complete package. There you have it, dear viewers. The Quantum Quartet in all of their dutiful glory and who still manage to look exceptional even in their 50’s. I hope you all enjoyed this and I will see you all in the flipside. Take care and have a great spring. Mr. Green, Ms. Bellum, Professor Utonium, and Miss Keane from The Powerpuff Girls belong to Craig McCracken and Cartoon Network.